Hello! 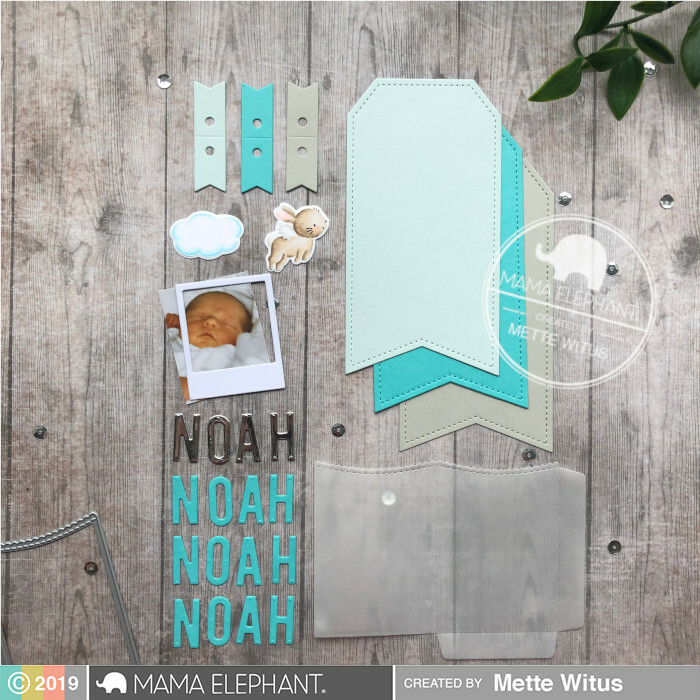 Mette here with my designer series project featuring the adorable Wish Upon A Star stamps and die sets. 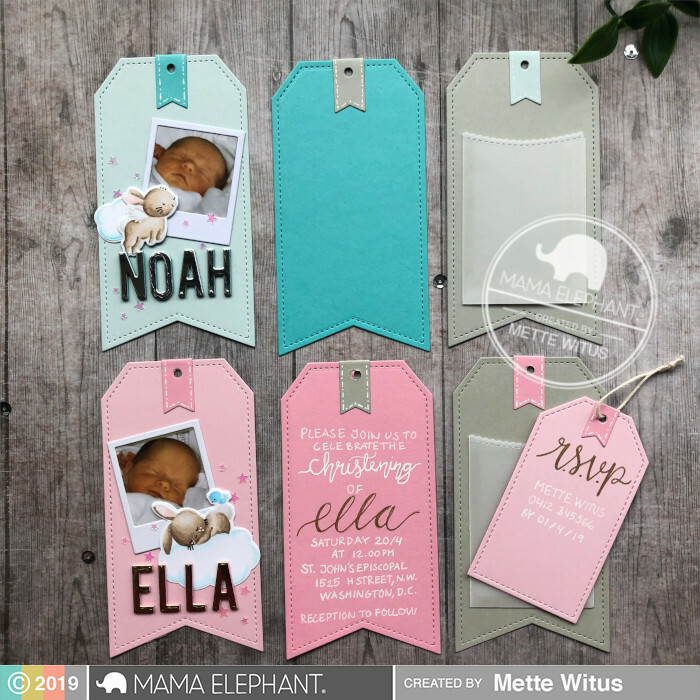 Today I used it as a part of a different christening invitation or gift tag. I started my project off with coloring the adorable bunnies from the set. I chose to do no line coloring as it gives a softer look, which I love for baby projects, and then simply die cut it using the matching dies. As the base for my invitation I used one of the bigger tags from Tags a Lot, which I cut from three different colors of cardstock – two blues/pink, one grey. I also cut the matching tag topper from the set in the same colors. I cut the little pocket from the new Sweet Feline die set from vellum, which will make it easier to see what is inside without having to take it all out. 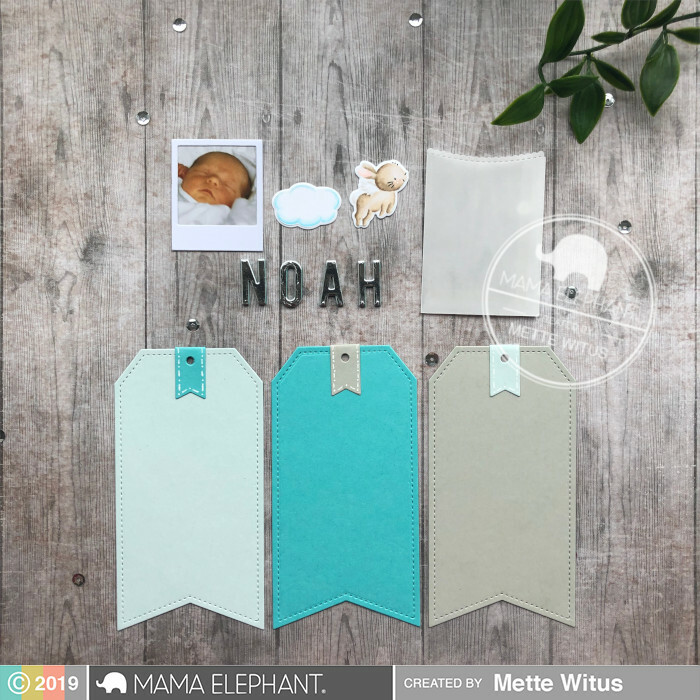 I began with folding my pocket and added it to the grey tag, which will be perfect for a cash gift or something a bit smaller than a gift card. For my pink version, I added the Embellished Tag, which fits the pocket PERFECTLY! – So I thought this could be a fun place to write my R.S.V.P. information – or a great place for a wish list maybe? For each of the tag toppers I added little white lines and dots with a white gel pen before I punched holes and glued them to the tags. 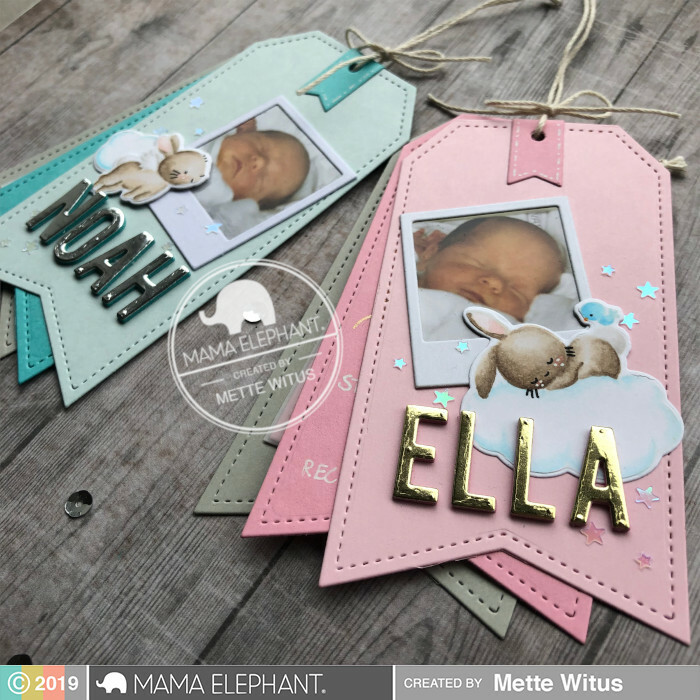 I used the darker colored tag for my message, which, as you can see in my pink version, is perfect for the invitation text (pardon my handwriting) – If you like, you can also print the text and then die cut it. If you’re not confident doing brush lettering by hand, you could use the Calli Letters and Calli Upper Letters sets, which make it sooo easy. Makes me wish I had thought of using them before! On the light colored tag I added a photo using the small frame from Polaroid Fun – To make sure it was okay to share it, I used a photo of myself just 3 days old – wasn’t I just cute? On top of my frame I added my little bunny, making sure not to cover up too much of the photo. I used the Inline Letters dies to cut out the name once from gold and three times from the darker colored cardstock. 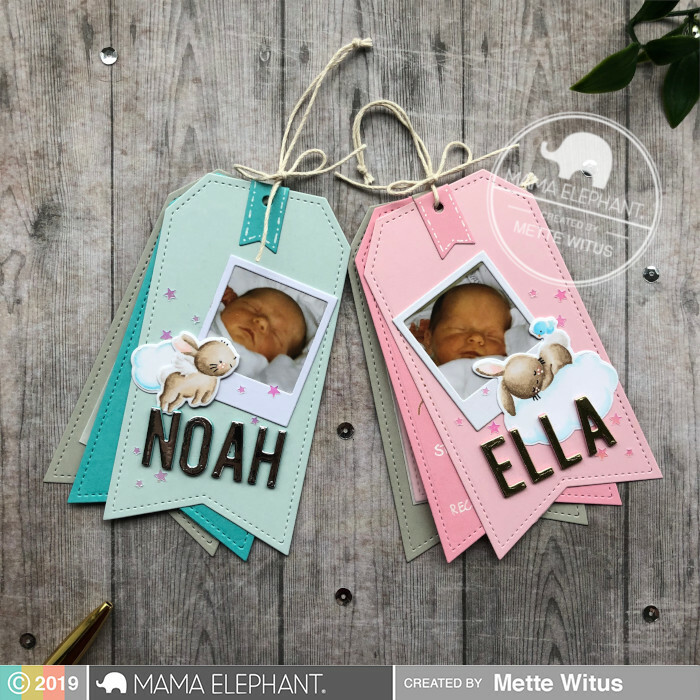 I glued these together to add a bit of dimension and then added them to my tag. Finally, I added a few iridescent star sequins and tied the tags together using a bit of cotton thread. Thank you so much for stopping by – Hope you have a wonderful day! One of the sweetest projects I've seen! The bunnies are adorable & the design is perfect!